Review: Barbatuques, a well known Brazilian group of body percussionists, originally recorded "Baiana" back in 2005 - which became a staple of their concerts. 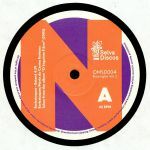 It is now issued on vinyl for the first time, marking the second volume of Brasingles: a new series on Selva Discos dedicated to releasing 'loud' 12" singles. On the first side, the original is a modern folk song from Bahia composed by Maria do Carmo Barbosa, and featuring a wild mouth harp sound with a stomping Barbatuques' arrangement that imprinted its trademark sound. German producer Jan Schulte (aka Wolf Mueller/Bufiman) heard the song and decided remix it to use in his DJ sets - adding more drums to brilliant effect.